The quiet of the day is destroyed by the roar of a Space Shuttle rising of the pad. In this historical photo from the U.S. space agency, hundreds of birds scatter as the typical quiet reverie of their day is temporarily broken by the roar of a Space Shuttle surging off the pad on Nov. 3, 1994. The orbiter Atlantis returned to space after an approximately two-year absence with a liftoff from Launch Pad 39B at 11:59:43 a.m. EST. 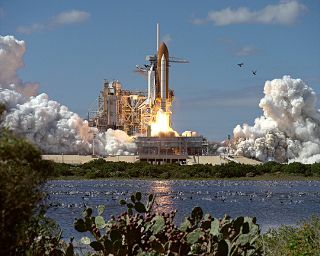 The planned 11-day flight of Space Shuttle Mission STS-66 will continue NASA's Mission to Planet Earth, a comprehensive international collaboration to study how Earth's environment is changing and how human beings affect that change. Primary payloads for the last Shuttle flight of 1994 include the Atmospheric Laboratory for Applications and Science (ATLAS-3), making its third flight, and the German-built Cryogenic Infrared Spectrometers and Telescopes for the Atmosphere-Shuttle Pallet Satellite (CRISTA-SPAS), which will be deployed and later retrieved during the mission. Mission commander is Donald R. McMonagle; Curtis L. Brown Jr. is the pilot; Ellen Ochoa is the payload commander, and the three mission specialists are Joseph R. Tanner, Scott E. Parazynski, and Jean-Francois Clervoy, a French citizen who is with the European Space Agency.